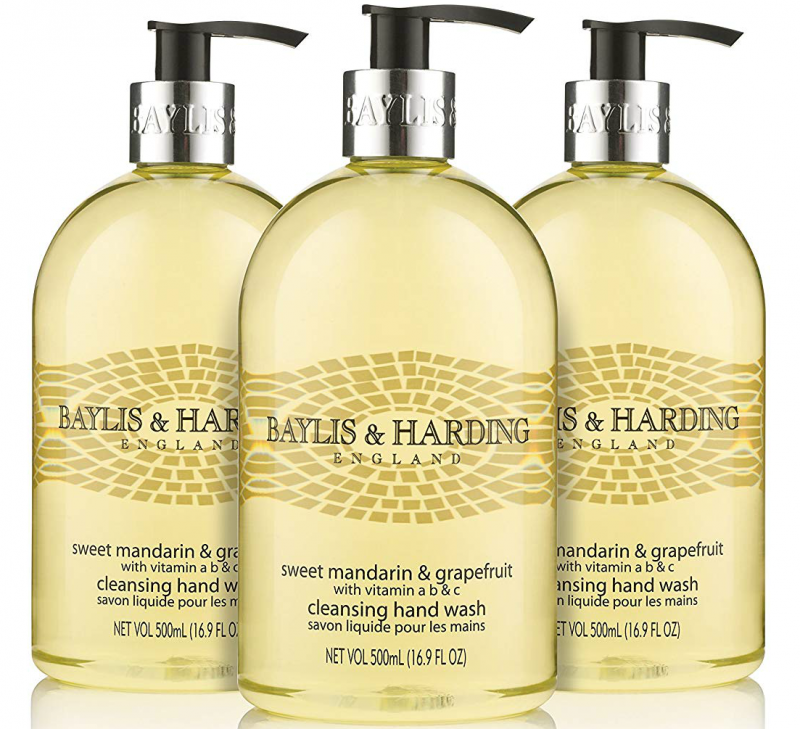 Sweet Mandarin & Grapefruit of Baylis & Harding is a luxury handwash that contains vitamin A, B and C extract. 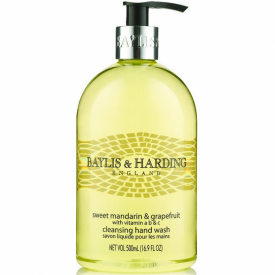 Its scent is a subtle yet spicy fusion of soothing jasmine and orange blossom behind zesty top notes of sweet mandarin, grapefruit and lemon. The wash comes presented in an elegant clear bottle. 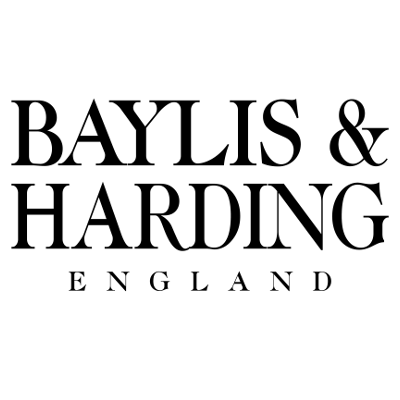 Ideal for adding a luxurious touch to your bathroom. Apply to moist skin, lather and rinse well. Aqua (Water), Sodium Laureth Sulfate, Sodium Chloride, Cocamidopropyl Betaine, Parfum (Fragrance), Trisodium Sulfosuccinate, Citric Acid, Benzophenone-4, Triethylene Glycol, Propylene Glycol, Benzyl Alcohol, PEG-40 Hydrogenated Castor Oil, Magnesium Nitrate, Methylchloroisothiazolinone, Magnesium Chloride, Retinyl Palmitate, Sodium Ascorbyl Phosphate, Potassium Sorbate, Panthenol, Methylisothiazolinone, Sodium Hydroxide, Hexylene Glycol, Limonene, Linalool, Hexyl Cinnamal, CI 19140 (Yellow 5), CI 15985 (Yellow 6). 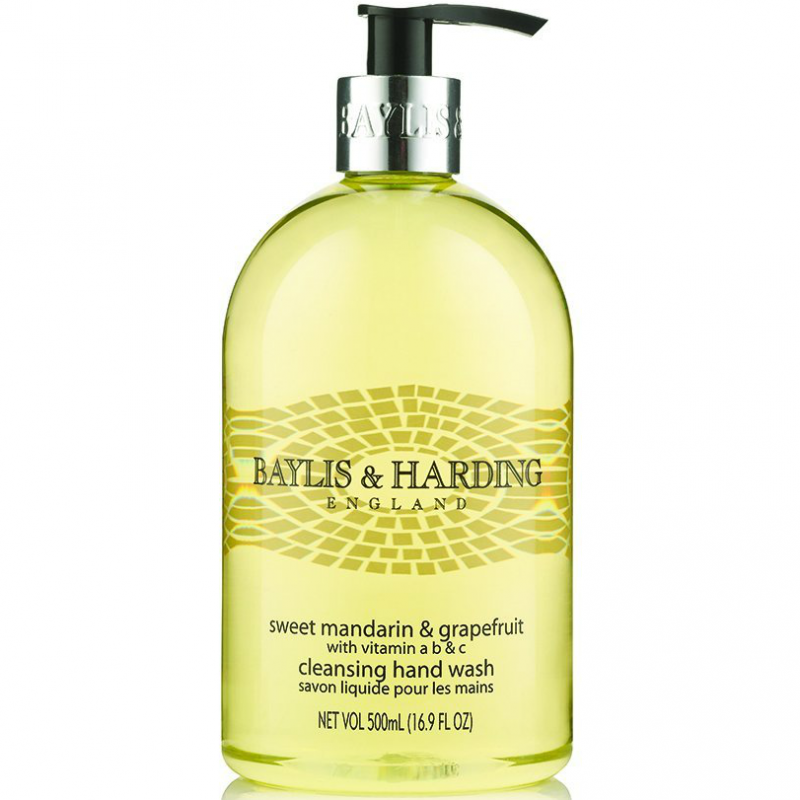 Baylis & Harding Sweet Mandarin & Grapefruit Hand Wash is very hard to miss on the sink due to its elegant design. Upon the closer inspection the bottle is of a simple plastic, but still it is a nice addition to a bathroom or a kitchen. The wash is basically a transparent viscous gel with an extremely pale yellow (or rather lemon) colour. It has a pleasant sourly sweet scent of a mandarin. The wash efficient, it lathers well and just one press of the plunger is more than enough to wash your hands thoroughly. It is decent enough to wash the entire body in dire need (I had tried several times and was satisfied with the results). The wash is very cheap and comes in bottles of different sizes - I personally recommend the 500ml bottle which lasts more than 7-7.5 months. The ingredients are not as natural as one would wish them to be, but in all other respects it is a great cleanser and even greater bargain!